A Russian female shaman with no real name (and appears to be named after a Russian goddess), her abilities were awakened by psychic experimentation prior to the fall of the Soviet Union. 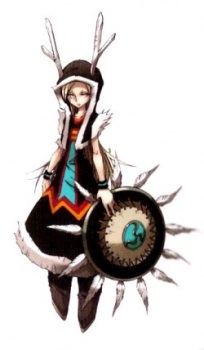 Her Guardian Ghost is Vodyanoy, allows her to release water against a target, usually to be frozen by Pino. Zria is named for the Zorya of Slavic mythology, as well as Gari Gari Kun ice pop's and Yuri Gagarin.